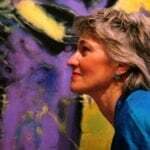 Judy Ann Hawes, (also known as Chili), FRGS, is one of the Founders of October Gallery and Director since its opening in 1979. A native of the Rocky Mountains, she obtained a BA in French Literature from Colorado College, with a year at the Sorbonne and post-graduate work in Linguistics at Claremont Graduate School and has taught at all levels of the educational system both in the USA and Australia. A founder and director of Institute of Ecotechnics , she has managed various ecological projects in the high desert of New Mexico, the Outback of Australia and the south of France. She has traveled widely including major research trips for the October Gallery to India, Melanesia, Peru, Southern Africa and Fiji.